Live music a spa and a kids' club are a few of the welcome features at the non-smoking Sunscape Puerto Plata All-Inclusive. The three-story Sunscape is made up of 16 buildings and features 585 rooms with private balconies or terraces coffeemakers cable TV and minibars. Non-smoking rooms are available. All-inclusive features include drinks plus breakfast lunch and dinner via eight restaurants. Around-the-clock options are also available. In-house activities include intro scuba classes surfing motorized watersports tennis and more. For some down time book a session in the spa or enjoy a swim via two year-round outdoor pools. There's also one for the kiddos. Additional plus-size perks include a golf course clubs for kids and teens an indoor theater and live entertainment. Free parking is included. 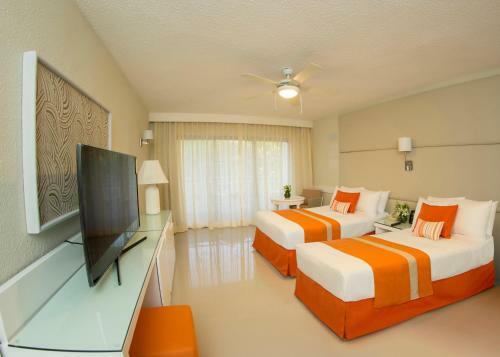 The Sunscape resort lies off Playa Dorada and the Atlantic Ocean less than five miles east of Puerto Plata museums. A 12-mile journey leads to the peak of Cristo Redenter in Isabel de Torres National Park. Gergorio Luperon International Airport is less than 10 miles away. discover all that Puerto Plata can offer you!